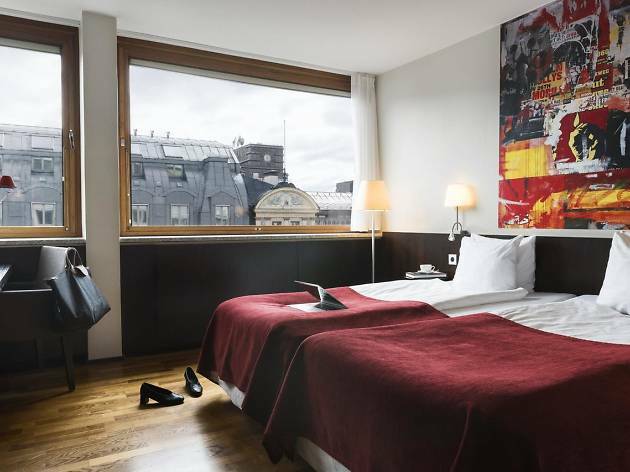 Scandic hotels are a well-trusted name across Scandinavia, and their Anglais offering puts you right in the centre of opulent Östermalm. Graffiti murals on the walls and bed cushions decorated with coats of arms make for an eclectic décor across a hotel that is otherwise in a classic and modern Swedish design. Within the hotel you’ll find not one, but two bars (one of which claims to have the longest bar in Stockholm), a gym complete with a sauna and jacuzzi, and the Stockholm branch of Jamie’s Italian. There’s even a roof terrace to watch all the action from in the summer. Östermalm, Stockholm’s east side, is where the rich and famous of Sweden come to play. 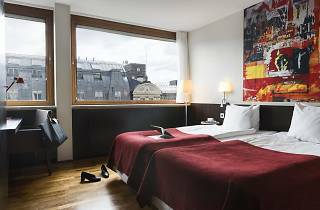 The Scandic Anglais sits by Stureplan, a crossroads lined with popular bars, clubs and restaurants. If you need a break from all of the buzz, there’s the quiet and leafy Humlegården park just next-door. 1. Phil’s Burgers, Stureplan: For one of Stockholm’s top burger establishments. 2. Johan & Nyström: For artisan coffee by one of Stockholm’s best-loved baristas. 3. Glen Miller Café: For intimate jazz concerts. The most basic rooms at the Scandic Anglais come without windows, but if you upgrade to one of their ‘best view’ rooms, you can wake up to see the lush and leafy Humlegården park outside your window.